The United Church of Canada diaconate has its roots in the Methodist and Presbyterian Churches, which both had Deaconess Orders prior to the 1925 union that created the United Church. These denominations were shaped by the thriving British model of the diaconate which emerged around the 1860s, following the revival of the diaconate in continental Europe about 30 years earlier. Missionary work for women, largely for overseas service, was well underway in both denominations by 1876 when interest in establishing a Canadian service corp for women emerged. 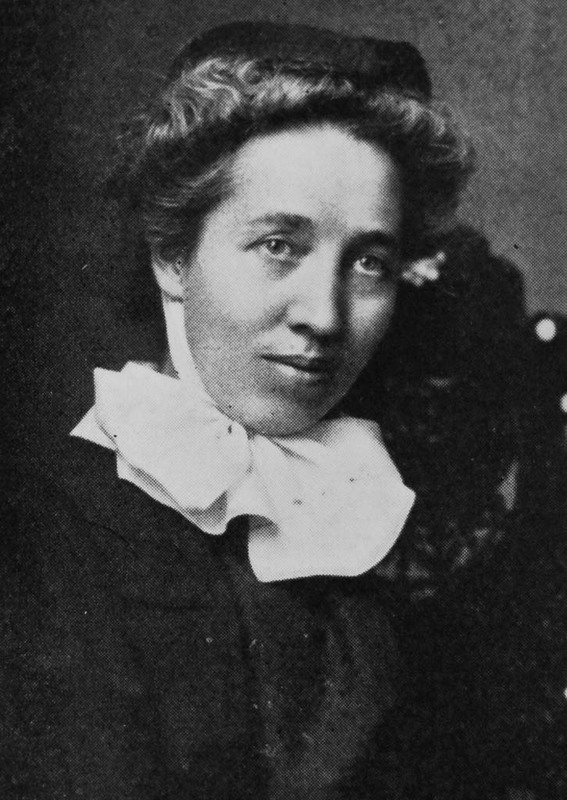 The movement was fueled by several sources of energy: the diaconal revival in Europe, already taking hold in the United States; the well assessed work of women in foreign service; the developing social gospel theology with its emphasis on addressing social conditions and its attendant political theory of maternal feminism; and, the growing number of middle and upper class educated and urbanized women, particularly young women, anxious for an opportunity to be of service in the world, at least until they assumed the primary vocation of wife and mother. Reluctance to establishing Deaconess Orders prevailed though in the national bodies of both the Presbyterian and Methodist Churches. 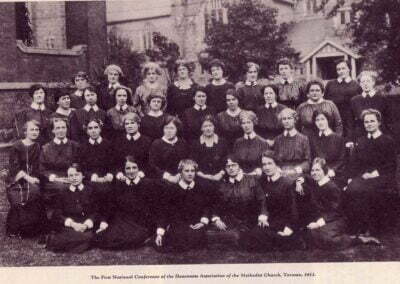 When a local Toronto Conference group decided to take action on an “organization of consecrated Christian women, similar to the order of deaconesses in Primitive Christianity” in 1893, the Methodist Deaconess Aid Society was established. The following year, 1894, the Methodist Deaconess Order was instituted. ln 1897, the Ewart Missionary Training Home was established in Toronto by Presbyterians there. In 1909, the Presbyterian General Assembly established a Deaconess Order and the name of the school was changed to reflect it. Similar Orders in the Church of England (Anglican), Baptist and Lutheran Churches emerge at this time. The Anglicans and Baptists establish schools in Canada and engage their Deaconesses in much the same manner as the Presbyterians and Methodists. Over the decades there are times when the schools work cooperatively and the students take some courses together. The Lutheran ties are to their counterparts in the United States. Women were serving in Foreign Missions even prior to the establishment of the Deaconess Orders. Jane Kinney, a Presbyterian graduate from 1902, taught at Toyo Eiwa Girls’ School in Japan. Picture used with permission of Toyo Eiwa. Similarities between the two Orders outweighed differences. The Presbyterian Order, much like the Methodist’s, was open to “godly women of mature faith between the ages of twenty-two and thirty-five who had passed High School and who would take the prescribed training in the Deaconess Home.” It was so well understood that the Orders were only for single women (or widows) that it was not even made explicit in the rules. The expectation that the women would have one day a week off had to be noted however, suggesting that women experienced a seven day work week. Work as a Deaconess would include meeting the sick, lonely, bereaved and troubled; finding employment for people; looking after travelers, conducting Sunday Schools and clubs for women and children. Presbyterian Deaconesses served overseas and in Canada, while in the Methodist Order, a Deaconess taking an overseas appointment left the Order. They were expected to wear a uniform, and in some cases, live in a supervised home where they were required to do additional work both in the surrounding community and within the residence. The promotional material of the time describes the women as excellent housekeepers, knowledgeable in music, able to work as religious teachers and to take Sunday services when necessary, all showing “the bright side of her personality”. Methodist Bishop Ninde wrote, “When I see all about me these consecrated women… it seems to me … a ladder is lifted skyward with the angels of God ascending and descending thereon.”[i] The image of Deaconesses as angels is a dominant one over the next 60 or 70 years. 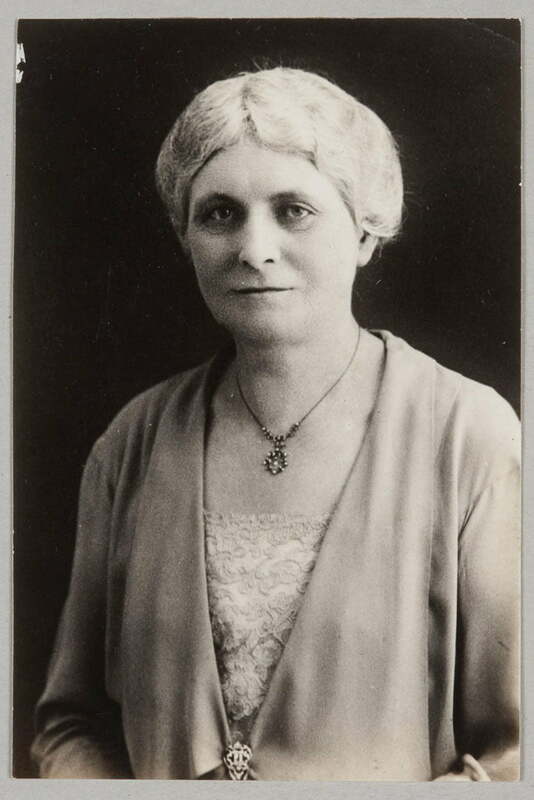 After Vera Clark’s missionary husband died in 1925 she left China to enter the United Church Training School. 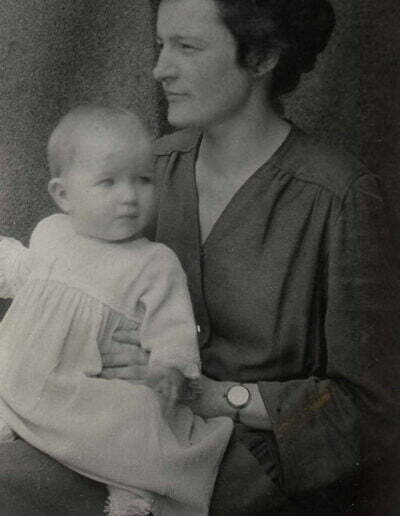 Her work as a Deaconess was in congregational education until she remarried and was disjoined in 1945. 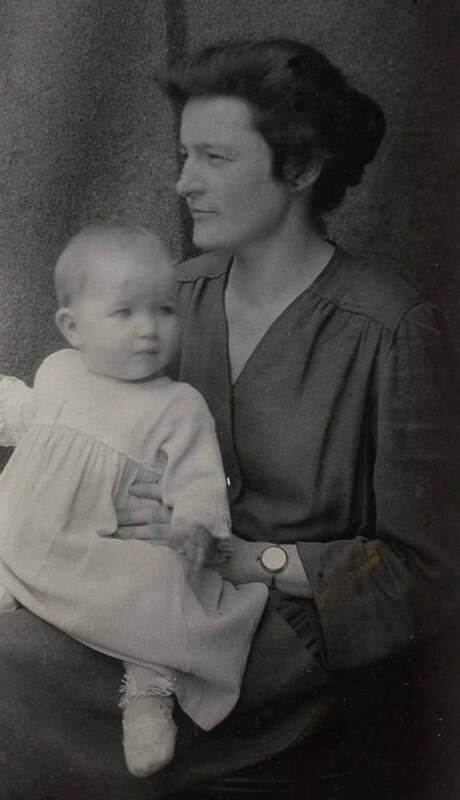 Here with daughter in China in 1921. 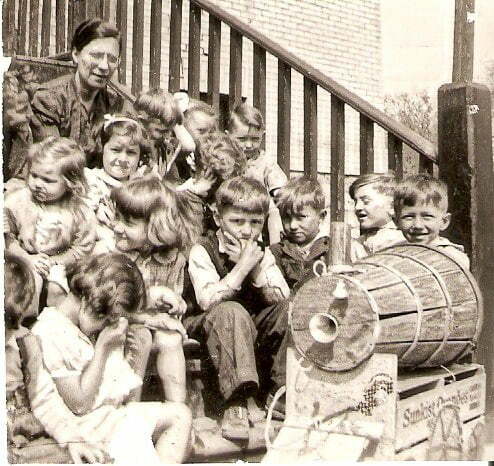 Deacones Olive Shaw staffed Sutherland Mission Kindergarten, providing free childcare for inner city Winnipeg families before daycare was common. This picture is from 1938. Courtesy of Crescent Fort Rouge UC, Winnipeg. Many questions arose regarding the personal life of the workers. So many are doing far more than their strength allows. Cannot some guidance be given as regards hours, free time, etc? Many are cut off from social life, and not only those in isolated places; through lack of ordinary human thoughtfulness others in large centres are quite as lonely. Some are “square pegs in round holes”. While much thought is given to this matter, even greater care must be taken to study the special gifts and preferences of each so that so far as possible each is placed where she can give her largest service. This report is in keeping with information gathered by the Methodists when in 1922, twenty-six of the forty-three active Deaconesses brought to the General Conference their claim that Deaconess work was “steadily losing ground”, even when compared to secular professions for women, and did not occupy the prominent place in the church’s life that it should. They even suggested the Order be disbanded if the concerns were not addressed. The Order did not end even though the conditions did not markedly improve, although the minimum salary was raised to $780.00. 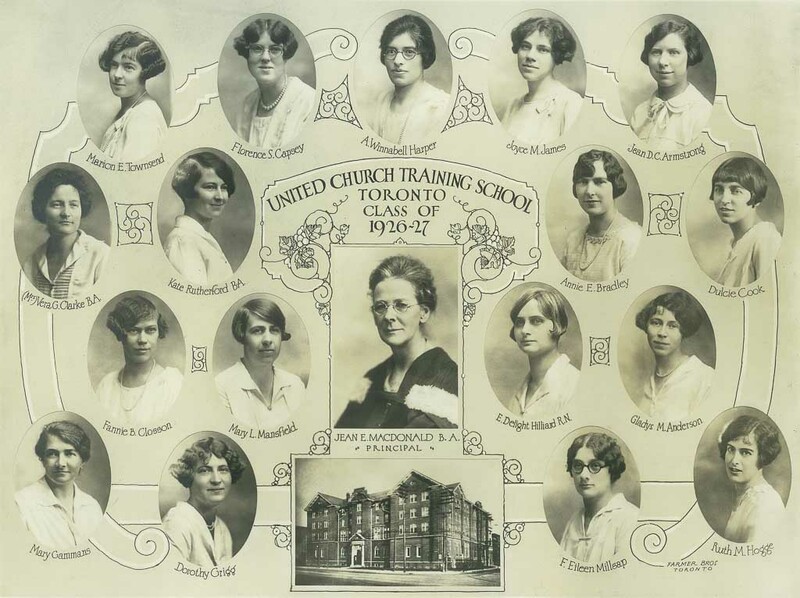 Following up on Winnifred’s observations, in 1927 the United Church undertook a study on the whole question of trained women workers. This was to be the first of many studies conducted on the role of “non-ordained professionals”. The details vary, and the context for the investigation shifts somewhat over time as the role of women in society begins to be liberated, but in essence each study achieves the same results. The importance of the work, especially in social service and education is noted, the caliber of the education, with its integration of theory, theology and practical skill development is lauded, and the need, indeed increased need, for diaconal ministry into the future is proclaimed. The reports also inevitably reveal that the workers are often exploited, with low pay and insecure working conditions, the church either doesn’t know about the potential or consistently undervalues the work, and the perception of the women as temporary, transient workers prevails, partially because with the disjoining rule and the cultural norm of married women leaving the work force there was some truth to the observation. Even in the earliest reports sexism is identified (even though the language is less explicit) as a concern. But the solutions suggested usually do not address the systemic issues. Rather, the plans for action are superficial. There is always a call for more publicity: “could we get an article in The Guardian, The New Outlook, The Observer?” depending on the decade. The workers are encouraged to buck up, work without complaint so that their modeling will be noticed and result in change. The courses at the Training School are adjusted, more of this, less of that, the admission requirements are raised, or lowered, sometimes both simultaneously, and, relationships with the “male” schools are courted and promoted; all in an effort to gain credibility. Some improvements are made for the women over the years, but it isn’t until well into the second half of the 20th century that significant change occurs. 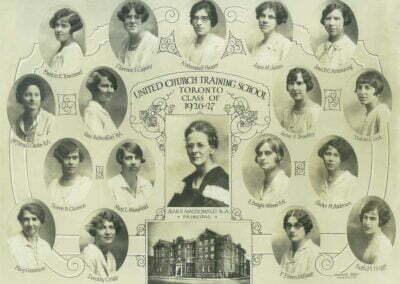 1926 -27 United Church Training School class, including Florence Capsey Karpoff, grandmother of Diaconal Minister, Kimiko Karpoff. Photo courtesy of Kimiko. 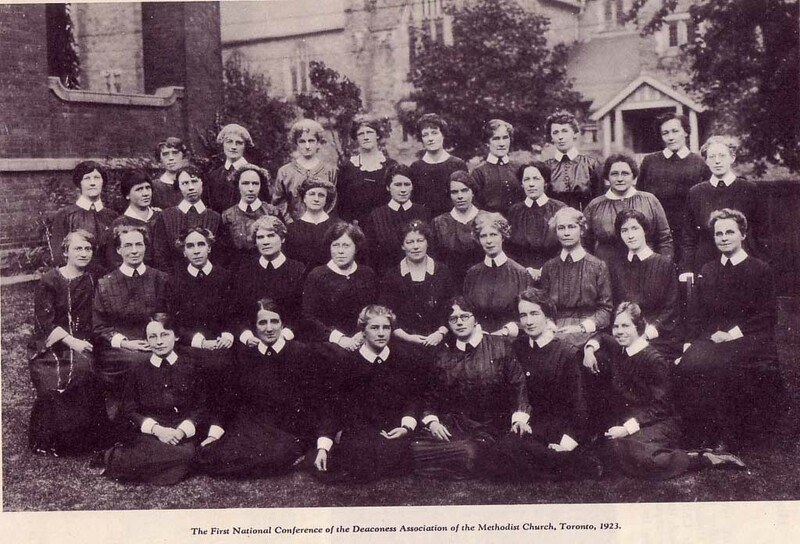 The First meeting of the Methodist Deaconess Association. The women were not represented in the structures that ruled over their work so they organized to strengthen their voice. For more on see DUCC History page. The baby boom years of the 50s and 60s created an unmeetable need for Christian Education staff, 1952 was the largest graduating class in the history of the United Church Training School. 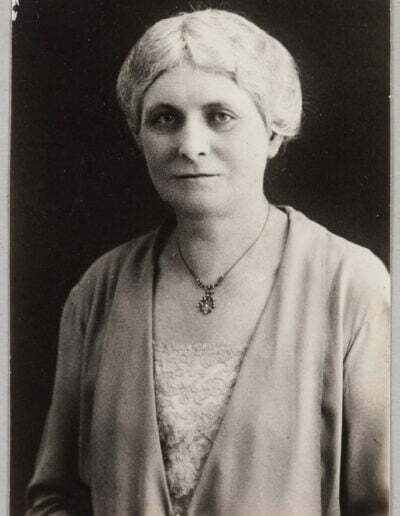 Women like Jessie MacLeod, Deaconess in Montreal, counted hundreds in the sunday school teachers that is! The student enrollment in 1959 was 987 children. In 1960, the rule requiring women to leave the Order when they married was repealed. It took a long time for it to be full eradicated but it marks the beginning of 20 years of transition. On the energy of the 2nd wave of modern feminism dramatic shifts occur. Men are allowed to enter what has been renamed Covenant College and a new category of “Certified Churchman” is created. Don Reid is the first male graduate. The newspaper article (see picture) in which the women reenact the curriculum requirement to learn to pour tea, portrays the power of sexism and patriarchy, but the satirical edge to this also demonstrates the opposing power of reformation that was emerging. It is also interesting to note that in 1963 the Toronto Star carried the graduation as a news story. Twenty years later that did not happen, indicative of the shift in relationship between the churches and the general culture. In 1962 women’s work in the United Church is redesigned. The Woman’s Missionary Society is folded and its work and assets are merged into the mission structure of the United Church. Thirty three WMS workers join the Deaconess Order that year, most with a hope it would gain them more security. Two years later Deaconesses become members of Presbytery, a long desired move enabling women to participate in the decision making directly affecting them. However, this means the end of the Deaconess Order as it was known. The Committee on the Deaconess Order and Women Workers ends, as does the staff position devoted to the work. Spurred by a drastic decline in students, especially for the Anglicans, and the rising interest in ecumenism, Covenant College becomes the bi-denominational Centre for Christian Studies in 1969. The influence of new Adult Education methodologies results in a significant redesign of the curriculum. 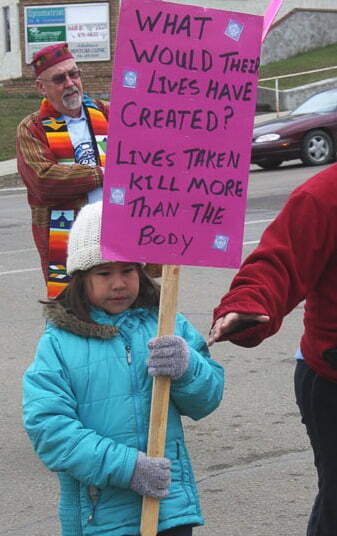 A shift toward a more liberal politicalized theology appears. Women are seeking ordination in significant numbers for the first time in history and new questions, and threats, about women in ministry are voiced. The old theology of diaconal service as “anything but ministry” is challenged with a widened appreciation for the diversity of ministry and an interest in equality rather than hierarchy. With the burgeoning awareness of the power of language the terms Deaconess and Certified Churchman become problematic. The backdrop context is dynamic for a series of reports, specialized meetings and debates. By 1982 the church arrives at these decisions: The United Church has one order of ministry, with two equal but different streams, The Diaconal Ministry of Education, Service and Pastoral Care and the Ordained Ministry of Word, Sacrament and Pastoral Care. Diaconal ministry has the same minimum pay scale, is a lifelong vocation, open to women and men, and people commissioned to this category are to be Diaconal Ministers. Challenges to stereotypes of Deaconesses as helpers with a ministry of servitude are challenged in the 1960s. 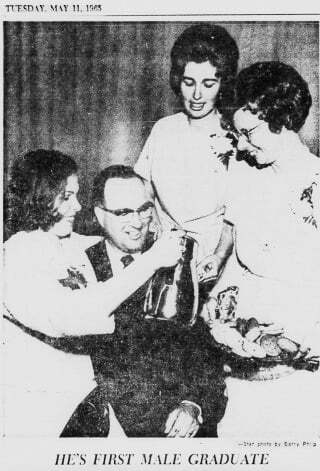 Don Reid, the first Certified Churchman with Deanna (Steadman) Wilson, Donna Allen and Norah Neilson, Toronto Star clipping 1963. HarrietChristie, a Deaconess (later ordained) was on the leading edge of women’s emancipation and tilled the ground that later feminists planted in. 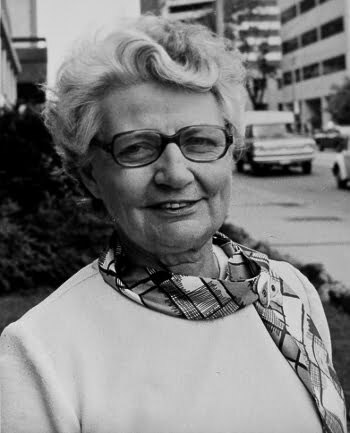 She was on staff at the United Church Training School as Dean and Principal and was the first woman to hold a senior position in the General Council offices. The dynamic context of the times through the period of the 70s into the early 90s is also reflected in the focus on the work being done. Many congregations were engaging educators, with some emphasis change, noted in new language, Minster of Education, and Christian Development, replacing Director of Christian Education. Smaller numbers of children and youth meant more emphasis on adult education. Resources were available for National, Conference even some Presbytery staff to work on social justice, in addition to ecumenical coalitions and projects, but the signs are apparent that the decline really happening for decades, is becoming more dramatic. The focus in diaconal education, mostly provided by the Centre for Christian Studies and through a pilot known as the Western Field Based Program, is on feminist and liberation theology. The character of the diaconal community is shaped by this profoundly, and by and large wherever diaconal ministers are engaged their commitment reflects this theological training. Many are frustrated however, that the priorities in their job descriptions, and increasingly the jobs available, make it hard to live out that commitment. During this time frame Francis Sandy Theological Centre and the Dr. Jessie Saulteaux Resource Centre also established program for Diaconal Ministry, (now the Sandy Saulteaux Spiritual Centre) with a focus on Aboriginal candidates. Through these decades of significant change the diaconal community takes new form as well. In 1984 Diakonia of the United Church (DUCC) is formed as a voluntary association of Diaconal Ministers. In 1992 a Statement of Belief is written. DUCC works independently of the United Church but with strong links to the church’s Committee on Diaconal Ministry, and the part time Diaconal Ministry staff person in the General Council office. By the mid 1990s no one can ignore the signs of the times. Christendom is not only dead, it is being fossilized. Church membership is shrinking, and aging, as is the leadership. Financial resources are fewer and an attitude of survival and a theology of scarcity mean that the resources are inwardly directed and conservatively invested. Ministries are closed, including many that might have employed diaconal ministers. The Committee on Diaconal Ministry and the staff position are two losses, and while other church bodies are to assume some of the work, it gets lost. (Sound familiar!) Grief is a predominant feature on the church’s landscape and it affects the diaconal community too. The church however, is not without hope and energy, peaking out around the margins sometimes, and bravely making its way toward the structures of power and decision making. Ministry studies and reflection on the needs of the church consistently point to the need for leadership that is: adaptive, enabling and empowering, focused on nurturing the gifts of lay people, and, able to facilitate a meeting of the gifts of church members with the needs in the world. The church also recognizes that leaders need strong skills in integrating theology with action and desire this as a priority in the training. Diaconal ministry, and the preparation for diaconal ministry are an obvious fit with the perceived needs of the church and the diaconal community is faithfully responding. For a bibliography on UCC Diaconal History, including links, click here. For Bruce Jackson, Diaconal Minister in northern Alberta, finding ways to be active in confronting injustice was important, but not always the priority of the congregation. Interview with Margaret Elder, 2009.